The Stokes Kith and Kin Community Blog: So, How Does that Garden Grow? So, How Does that Garden Grow? It is summer, and the garden grows, everything in it, higher, faster, each element with its own imperative, seeking to be unruled and unmanaged. Because it's summer we get "faster," but because it's life, I'm reminded, everything else. Just cutting the grass burns about two hours a week, at least the way I do it. That time would include not just the mowing, but the edging along the sidewalks, driveway and streets, and sweeping. There are set-up and take-down tasks as well. It takes time, and it is very hot and humid. I will use a grass catcher and will not skin the grass to the earth's scalp. The grass catcher is to catch not just the grass clippings, but the weed tops. By not dropping the blade closer to the ground (dropping and skinning would add several days to the interval between cutting, which is tempting but to be resisted), I encourage the St. Augustine to grow thick and healthy, thus crowding out the weeds. So that's the "how" of how that element grows, the turf. I attempt to grow my garden in a managed way, with lots of close observation, time, and sweat. As far as I can tell, none of my neighbors takes personal care of the family yard. Businesses known as "lawn services" take care of their landscapes. These services consist of two men, usually, but sometimes three. 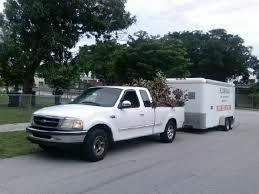 They come in a pick-up truck towing a trailer, usually an enclosed trailer. The trailer holds their equipment, the major piece being a riding mower. Each side of the trailer is a sort of billboard, announcing the name the business, often the owner's name with "landscaping" following the name, and a telephone number. These services appear to be single owner enterprises, the owner driving the riding mower. His associate or associates tend to the edging, usually with a weed-eater and not with a blade-edger. There are no grass catchers and there are no rakes or brooms much in evidence. The services deal with the debris that falls on the sidewalks and drive-ways with blowers, blowing the debris out to the street, where the wind will, in a day or two, blow it all back, some back into the family's yard and the rest on everyone else's. As I drive to work each business day, early in the morning on the Palmetto expressway, I see dozens of lawn service rigs moving with me southbound: towing vehicle, sometimes a van, usually a pick-up truck, but sometimes an impressive small dump truck, which would allow that service to haul away its lawn debris, and the trailer. These businesses are predominantly Latin. In Miami Springs, the going rate seems to be around $55 right now. They seem to be able to do the basic job in about 40 minutes or less, given the size of the yards in our neighborhood. It is a cash business. We use a professional service to help us to manage our trees (a very large oak tree in the back, a black olive tree near our driveway at the front, a gorgeous sea grape tree on the west side of our house, and some smaller palms). They also spray our lawn with herbicide and insecticide on a monthly basis. These people have given up lawn maintenance, because of the cheap competition from the lawn services I describe. But their managers have deep knowledge of Florida landscaping, and I have gotten to know one of these men over the years. Each year (before hurricane season, preferably) we will walk the yard together as he assesses the tree-pruning needs, and the gentleman will talk to me about lawn-care science. He calls the lawn services that work on the neighbors' lawns, "mow, blow, and go" services. In other words, you get what you pay for. Surprise. Once upon a time, the families in Miami Springs did the yard work. Dad, mom, and the kids. Especially the sons. Often a neighbor, being an eyewitness to the competence of one of the boys, would ask the boy to mow the neighbor's yard. It would provide the boy-becoming-a-young-man with a little income. Now and then, the young man would turn that work into an after-school business. By the time of his graduation from high school, he would have accumulated a significant amount of money, not to mention significant business expertise of all sorts. But whatever the eventual outcome of the boy, the families handled the yard work. Now they don't. Across the street is a very attractive family with three boys, all now teenagers. They use a lawn service. Once when I was working in the yard in the summer's heat, the mother came over and expressed concern over the effort I seemed to be putting out, and gave me the number of her lawn service. I confused her. I could read her mind: Wasn't I a lawyer with better things to do? Here toward the end of the summer I find myself having worked my way almost completely around the house, edging, pulling weeds and grass, and mulching, But as I complete that first circuit, I see that the St. Augustine has shot its forces into and among the mulch that I first laid down weeks ago. There is plenty of metaphor fodder here. Stay tuned.